February 1, 2016, 11:30 AM · What to do, when you want to send your students to the great summer music program you once attended, but it's no longer around? Here's what Danielle Belen did, she started her own: Center Stage Strings, focused on solo and chamber music. Her program, which she started in Three Rivers, Calif., has been going -- and growing -- for seven years. Now that Belen, 32, is an associate professor of violin at the University of Michigan School of Music, Theatre and Dance, Center Stage Strings will move from California to Ann Arbor, Mich., as part of the university's MPulse Performing Arts Institute. How did someone start something so ambitious, so early in her career? And how has she kept it going? As with many things, it was part inspiration, part perspiration, part persistence, and a lot of help from her family and friends. The inspiration was Encore School for Strings, founded in 1985 by David and Linda Cerone and associated with the Cleveland Institute of Music. The program ended after David Cerone retired from CIM in 2008. "I went to Encore in 2002, 2003, and a little bit of 2004," Belen told me over the phone in December. Those summers at Encore were a time of remarkable transformation for Belén, and she noticed the same was true for her colleagues. "It's having that concentrated amount of time, every day. Sometimes you're even seeing your teacher every day -- it's crazy, what you can get done," she said. "It's really not a cliché to say that you can do as much in those six weeks during the summer as you can do in a whole year." Belen, who was the winner of the 2008 Sphinx Competition, started playing violin when she was five at a Suzuki program at her Montessori school in her hometown of Whittier, Calif.
"I was by no means a wunderkind or anything remotely resembling that," Belen said. "I did the Suzuki group classes for a while when I young. When I was nine, I loved to draw, and my dream was to be an animator at Disney Animation. But around the same time, about age eight, I started taking private lessons." Her early teacher, Edward Kersey, "really instilled a love of music in me," and he gave her enough free-range to play what she wanted to. "I was never scared of making a life in music; it always seemed possible. And my parents also always treated it that way; there was never a question of 'maybe you should do something that's more secure.' They had taken their own risks, starting their own businesses in computers. So it never seemed like too much of a risk, to be pouring myself into music." "I consider myself a little bit of a late bloomer; even though I started at a young age, it really wasn't until college that I started performing a lot," Belen said. "I didn't perform so much in high school; I was kind of scared of it actually. I had confidence in orchestra; I loved to be concertmaster, and I even had a couple students when I was in high school. Chamber music was a little scarier, and solo playing was really scary." How did she get over that? "I learned how to hold the bow right!" she said, laughing. "Or I should say, I learned how not to hold the bow. I always felt like I was going to drop my bow, that's what terrified me about performing. My bow was a war zone: I had pieces of felt glued around my bow to keep it from slipping; rubber, like cellists have on their bow; things strapped all over it -- and this is a Sartory bow that I had! My bow always was slippy and jittery, like it was just going to fly right out of my hand. I was gripping, I had a very tilted bow, I barely used the pinkie -- it was very tight and sweaty -- everything bad about a bow hold. It sounded fine, but it certainly didn't feel good. And you know, if it doesn't feel good, the performance doesn't feel good." "So Mr. Lipsett taught me how not to hold the bow, how to let go of the bow and come from a more relaxed place with the arm. He made me take off all my felt and rubber and all these little shenanigans -- those little pencil grips," Belen said. "I think that was the spark that turned me on to teaching, this whole transformation of my own bow hold -- learning from scratch, how to hold the bow. That, and then I have a bossy stripe in me -- anything I learn, I like to show other people how to do it." When it came to the Sphinx Competition, "Mr. Lipsett sort of 'made me' do the Sphinx," Belen said. "It was not something I thought I was cut out to do." But she did it, and she won it. "I think that was probably the most steep learning curve year for me, preparing for the competition -- because I was not on the competition track at all. For me, that was terrifying, that was not what I wanted to do! But I thank Mr. Lipsett for making me step up to that level." She had argued with Lipsett that she wanted to be a teacher. Lipsett said the competition experience would only enhance her ability to teach. It also would illuminate whether or not the teaching idea was just a phase for her -- whether it was a way to get out of solo playing. 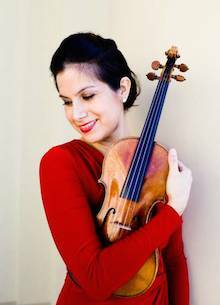 Belen, who plays on a 1709 Alessandro Gagliano violin from the Mandell Collection of Southern California, found that she grew to love solo playing. "But I also found out that teaching was definitely what I wanted to do; I didn't want to be traveling out of a suitcase all the time," Belen said. "I knew I wanted to be the kind of teacher that (Lipsett) is: there, day in, day out, in the trenches with every student and really building deep relationships with students and watching them grow." Part of watching them grow was encouraging them to go to a summer program; a place that could give them that incredible boost she knew that summer programs could deliver. There was only one problem: by then, "there was no more Encore! That would have been the natural place for me to send my students," said Belen. At that time, Belen was teaching at the Colburn School in Los Angeles, where she also was teaching assistant to Lipsett for more than five years. She began to consider the possibility that if she wanted to send her students to a camp like Encore, she might need to simply start one. "So Center Stage Strings started out selfishly; I wanted a place that I knew would be a quality learning environment." The spark that turned her idea into reality was when her parents retired and moved to Three Rivers, Calif. "My husband and I went to visit them at Thanksgiving in 2009, and I thought, what a beautiful place!" What they found was a picturesque town of 2,500 people, with a lake, right near Sequoia National Park, only a few hours from Los Angeles...."We ran into a guy named Bill Haxton -- I consider him the unofficial mayor of the town. He knew everybody and he was kind of a social/cultural organizer for the town. They'd had nothing there, in the way of classical music. So we started talking, and I asked him, 'What if I brought a few of my students up, and they camped out at my parents house...' I was thinking 10 kids or something, '...and we'd put on concerts...' I'd bring up a piano, give them mega-lessons, like a mini-Encore for a week, or even just a weekend. We'd perform, and I'd invite some of my friends up to play piano trios with me..."
And thus Center Stage Strings was born as a one-week program, in the summer of 2010. "The first year was such a success," Belen said. "We had about 200 people from town at concerts -- they were just hungry for it. A lot of people in Three Rivers are transplants from Los Angeles; it's quite a sophisticated bunch up there in the mountains. So we had an audience that really just flipped out over this." When it came to teaching students, the program was patterned after Encore. "I definitely was advised by Mr. Lipsett in the beginning: how things were at Encore, behind the scenes. That informed me a lot about building Center Stage," Belen said. They added viola and cello the following year, and extended the program to two weeks. They moved to a larger venue at a Catholic retreat center. As the program grew, they felt the need to improve practice facilities. "My dad and Bill Haxton have some construction in their background; they built these sound-proof little cubes that we called PractiCubes," Belen said. The "PractiCubes" were similar to Wenger practice units that cost about $800 each to make. "We needed to make about 15 of them," so they had a campaign and raised the funds. The units went up and came down every year, and they needed to go indoors because they didn't have individual AC units. "So we had a big, open room and we put all these PractiCubes in there," she said. "Basically, we made a facility that was not intended to be a music camp into a very workable music camp." "My parents did so much -- and still do so much," Belen said. "We became an official non-profit, 501C3, right at the beginning, but we really just kept the same staff, which was my parents and me. My husband, for a long time, was in charge of student life, kind of like a counselor, RA. And we eventually had a little counselor team, activities for the kids, they would take the out on the lake, crafts, swimming." With the move to the University of Michigan, Belen -- and her parents -- can concentrate more on building the program and less about those kinds of logistical details. "My days of fundraising are not over, so my parents will continue help in putting together a benefit concert for scholarships," she said. "Artistic choices -- faculty and student selection, schedule, calendar -- all of those are still very much in my hands, which is great." Last year Center Stage had about 35 students; being at Michigan allows it the capacity to grow. This year, the program will be four weeks long. "Encore was somewhere around 100 kids," she said. "Applications are still coming in, so we don't quite know exactly where we're going to land, but we have the faculty to support anywhere between 40 and 50 kids this year and I anticipate already that more college-age kids are going to be applying and that it's going to be even more competitive for the younger kids. So the level of the younger kids, it's always been pretty astounding, but perhaps even more." As they grow, Belen wants to continue to keep the focus on quality. "I always hear Mr. Lipsett's voice: it's always about the quality and the standard that you set," she said. "From the beginning, we wanted great faculty, and I guess the challenge is growing in a natural way. We're here to maintain a standard. Not that every kid coming in will be the next Sarah Chang, but that every kid coming in has a lot of potential, and that they're good, balanced people." To that end, Center Stage has something called the Complete Musician program, headed up by Kay Crask, who was Belen's orchestra teacher in high school. "Complete Musician has been really successful," Belen said. "Kids at first are sometimes resistant to it, because it's all the things they don't want to do: public speaking, presenting themselves, being able to introduce themselves to people, being able to write e-mails to prospective teachers, how to interact with with adults and other colleagues. Life skills that I've seen so many programs pass over." This, as well as a stronger focus on Chamber Music, is where Center Strings departs from the Encore model. 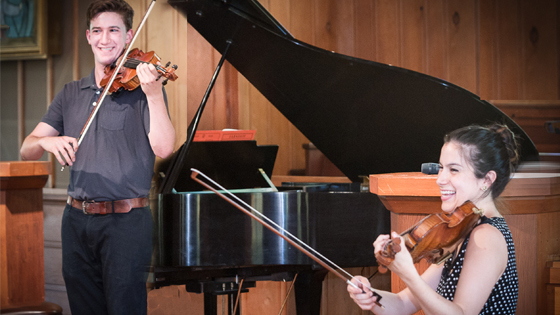 "I know the Heifetz Institute does things like acting for musicians and public speaking. I feel this is definitely important. So many of the kids are not natural at these things. They have to be given the opportunity to feel uncomfortable in front of their peers and learn -- that's the only way, to get up in front of people and do it. Last year we had kids who were so shy and awkward in front of an audience. We had them to it over and over, and by the end, they were making really lovely introductions of their pieces, talking about the composers or what a piece meant to them -- finding their own style. You don't even need to be a perfect speaker, you don't even have to be that eloquent. You just need to be open and honest -- to connect to the audience in some way. Even if that way of connecting is by being a little bit awkward!" The deadline to apply for Center Stage Strings is Feb. 12. February 1, 2016 at 09:37 PM · Laurie asked, "How did someone start something so ambitious, so early in her career?" Often the early part of one's career is the best time to reach for something challenging. Especially if your parents are still around and healthy and willing to help out, and if you don't yet have children of your own. That's the time when you've got the most energy and the freshest ideas.